HAIR OF THE DOG GROOMING 275 SE 4TH, Estacada 503-630-4916 Full service dog grooming since 1997. 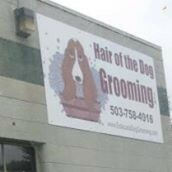 Conveniently located in downtown Estacada We are here to meet all your dog grooming needs. Spa services also available. We look forward to serving you.